Alongtek Corporation is a reliable manufacturer of Floral Tape, providing various Floral Tapes, Crepe Paper and issue Paper for the highest quality and superior customer satisfaction. Contact us for more information and a competitive quotation on your requirement of Floral Tape. Convenient use for wire coverage and stem wrap. Flower Tape has great stretch and using less tape. 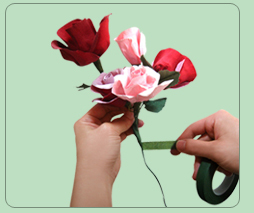 Flower tape does not stick to the finger but stick to itself and flower stems when stretch.